is a great way to improve your writing. I was invited to speak at an introduction to editing college course yesterday. The class takes a look at the publishing industry and it was a blast. As soon as I started talking about editing, I kind of threw out my notes. Probably not the best idea, but I realized I wanted to hear their questions and concerns. What they wanted to know trumped anything I had planned and wanted to tell them. We talked about micro-editing. Not the big-picture editing where you are moving through a manuscript to look at the scenes from the view at 50,000 miles above to see if they will work. But the editing that focuses on whether you have repetition or if you are stuck in the passive voice. The students are approaching it from the self-edit perspective, but in many ways their learning could apply to editing for a client or employer. Some questions the students bounced around were everything from how much does someone pay for editing (it depends on the level of editing) and are there different kinds of editing (yes, lots, including cookbook editing). At one point, I projected a manuscript so they could see it and asked them to take it to the level of a micro-edit. I asked them to list what they would look at within a manuscript to start a micro-edit. What would they do first? When I first started as an editor, I kept a checklist nearby to make sure to cover the important elements of a manuscript. Now I work in such a way that I don't rely on a checklist (as much). 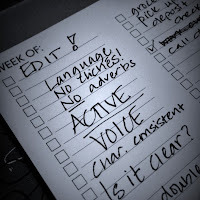 But when it comes to my own work, the editing checklist is buried. So I started wondering, if I had a micro-editing list for my own writing, could I write something specific to follow to ensure a better quality of writing? Why not? I learned to type in the two spaces after a period era, I always need to check myself on that one! Is this a specific type of writing that has a formula that needs to be followed? If so, have I followed the conventions or have I used my own style? Am I repeating myself to my reader? What is my writing group or reader always pointing out to me as problematic in my writing? Am I showing actions, not telling about them? What would be on your list? Do you have an idea of your strengths and weaknesses? 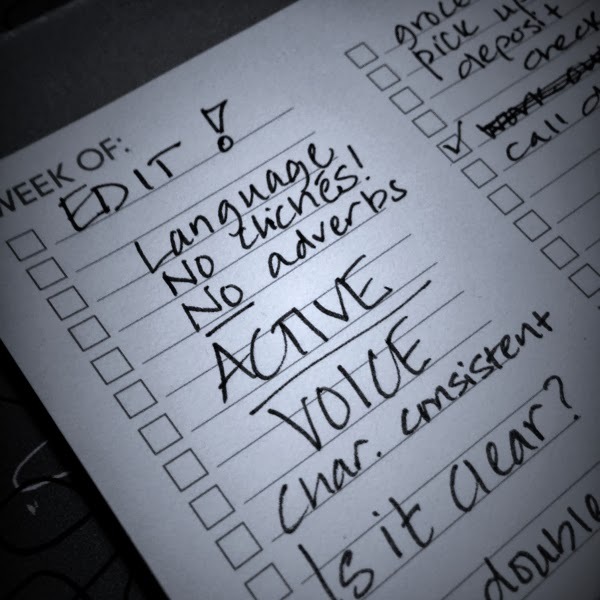 Do you already have a list of edits you need to make for your work? Elizabeth King Humphrey is a writer and editor in the throes of updating her website. She's using a checklist for that. Absolutely. I think a good one is always to check yourself for your favorite "extra words," such as very, just, even, etc. Am I overusing certain words or phrases? Word frequency counter software helps with this task.